Vie Long Cachurro Pro Horse Hair Brush | Old Morris Tobacconist Victoria BC, Fine Cigars, Humidores and Tobacco Merchantile. 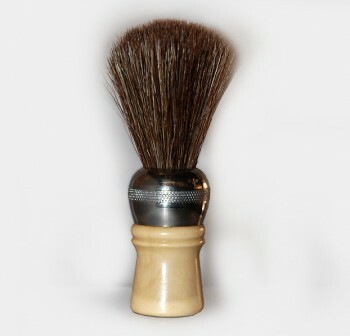 Horsehair brushes have a number of advantages over other materials. Hand-selected, the Cachurro’s hair is absorbent and pleasant to use, with the softness of badger and the body of boar. And, because the hair is taken from manes and tails, no harm comes to the horse. This Vie Long brush was originally designed for professional barbers, and so has a long, easy-to-maneuver handle and a longer than usual knot for a faster, richer lather. Its hardwood and nickel handle gives the brush an elegant and satisfying feel of quality and craftsmanship.